M Murali examines the key developments in the Indian roads sector and the huge potential to take the sector to a brighter 2016. India has the second largest road network in the world, aggregating 4.7 million km. And the countrys roads and bridges infrastructure, which was valued at $6.9 billion in 2009, is expected to touch $19.2 billion by 2017. The financial outlay for road transport and highways grew at a CAGR of 19.4 per cent in the period FY 2009-14.The plan outlay for 2015-16 stepped up budgetary support for Road Transport and Highways to Rs 42,912 crore ($ 6.47 billion). Highway projects worth $93 billion announced, with an investment of $45 billion over the next three years. Development of about 7,000 km of national highways under Bharatmala Pariyojana undertaken at an estimated Rs 80,000 crore ($12 billion) in consultation with state governments. The National Highways Authority of India (NHAI) has invited bids for preparing detailed project reports (DPRs) for road development along the borders and coast lines under the Bharat Mala project. The Cabinet Committee on Economic Affairs (CCEA) has permitted 100 per cent equity divestment by private developers after two years of construction completion for all BOT projects, irrespective of year of award. CCEA has also approved six highway projects totalling 712 km with an investment of Rs 12,646 crore. To be awarded under the EPC model, these are divided into 10 packages under the NHDP in states like Uttar Pradesh, Madhya Pradesh, Odisha, Himachal Pradesh and West Bengal. Approval for construction of around 1,000 km of expressways at a cost of Rs 16.68 crore ($2.5 million) on design-build-finance-operate-transfer (DBFOT) mode. The approved corridors are Delhi-Chandigarh (249 km), Bengaluru-Chennai (334 km), Delhi-Jaipur (261 km) and Vadodara-Mumbai (400 km). The government will also develop the 135-km Eastern Peripheral Expressway at an estimated Rs 5,763 crore ($868 million). The Ministry of Road Transports and Highways (MORTH) plans to award 273 road projects covering around 12,900 km at an estimated Rs 1,26,700 crore (U$ 19 billion) in FY 2015-16. Chhattisgarh plans to invest Rs 9,500 crore ($1.43 billion) to upgrade 44 roads in the state. To revive private investment, MORTH is working on two more models: One proposes allowing bidding for a road project on the basis of the least present value, and the other envisages selling off road projects built using government funds. The government plans to set up a finance corporation with Rs 1 trillion ($15 billion) in collaboration with Japanese investors to fund road projects. The government is set to offer the final batch of road projects for this financial year. A total of nine, with a cumulative length of 895 km and project cost of Rs 17,815 crore, are to be offered soon. Three are expected under the BOT model, while the other six will be offered under EPC. The NHAI had introduced the OMT model in 2009 for existing and near completion four-lane National Highways. It is providing consistent revenues. The concession period for NHAI projects is nine years, after which the project stretch is transferred back to the government authority. In 2013-14, ~5,150 km of road projects were provided under the OMT model by NHAI and state authorities. The OMT market will primarily be driven by a number of BOT players with existing projects and there will be rising penetration of OMT stretches in state highways, especially in Karnataka, Bihar and Madhya Pradesh. The number of projects bid out by NHAI and state highway authorities on OMT mode is expected to increase from the current 14 and 34 projects respectively to 30-32 and 55-60 projects respectively in 2017-18. The hybrid annuity model (HAM) is a mix of EPC and BOT formats, with the government and the private companies sharing total project cost in the ratio of 40:60 respectively. This new model will reduce financial burden on the concessionaire during project implementation. Compared to EPC projects, the shift to HAM would also ease cash flow pressure on the NHAI. 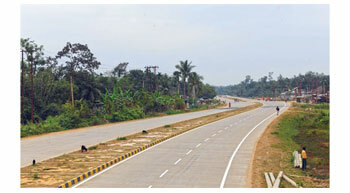 NHAI is expected to introduce HAM for award of highway projects by year end. Toll collection also holds huge potential ahead. NHAI has handed over the toll collection process to private players of toll management companies. The contracts awarded are usually short-term contracts (~3-24 months in case of NHAI projects and ~12-36 months in case of state authorities). The user fee is predetermined by the contracting authority and the right to collect the fee during the concession period lies with the private player. According to industry experts, the tolling market is expected to increase 1.4 times from the current 12,150 km to ~16,900 km by 2017-18 and will primarily be driven by rising penetration of tolling stretches in state highways (especially in Karnataka, Rajasthan and Haryana) and the increasing number of stretches being awarded by NHAI on tolling basis. The number of projects bid out by NHAI and state highway authorities on a tolling basis is expected to increase from the current 120 and 102 projects respectively to 145-150 and 140-145 projects respectively in 2017-18. The government has set a target to award 273 road projects covering a length of ~12,900 km worth of ~Rs126,700 crore during FY16 under various schemes. NHAI will spend the highest at ~Rs 72,000 crore, followed by ~Rs 24,000 crore by the NHDP. The NHAI is implementing development projects on 48,648 km of National Highways under different phases of NHDP. Out of this, work on 33,351 km has already been awarded and balance 15,297 km is yet to be awarded. According to industry sources, potential opportunities include the Eastern Peripheral Expressway, a 135 km-long, six-lane expressway at a cost of $750 million; the 150-km Delhi-Meerut Expressway at $1 billion; and the 473-km Vadodra-Mumbai Expressway at $4.3 billion. Going forward, new policy initiatives, such as the rescheduling or deferment of premium payable to the government and the CCEA approving the exit policy norms according to which developers can now sell 100 per cent stake in any project two years after completion, will ease the liquidity position of developers, encouraging them to bid for more projects and paving the way for further growth of the roads sector. M Murali is Director General of the National Highways Builders Federation (NHBF).